HTC Vive Pro is a newly launched version of virtual reality headset. The headset does come with version 2.0 base stations, 2 controllers and a new headphone which boasts higher immersion allow users in making it an upgradable option. HTC Vive Pro is probably the first consumer-focused virtual reality headset and it is backed up by Valve and its mighty Steam marketplace. It entered the market with room-scale tracking and a pair of motion controllers. This powerful virtual reality headset offers a wonderful experience which cannot be compared with its expensive price and the money to purchase a powerful PC which can power them. HTC Vive Pro has come up with a no-holds-barred premium virtual reality experience that summarizes the development of advanced technology. It has an upgraded physical headset design with a wonderful look. The previous HTC Vive headset 1.0 was built with a well fitted elastic strap that is meant to keep the headset in position while being comfortable. 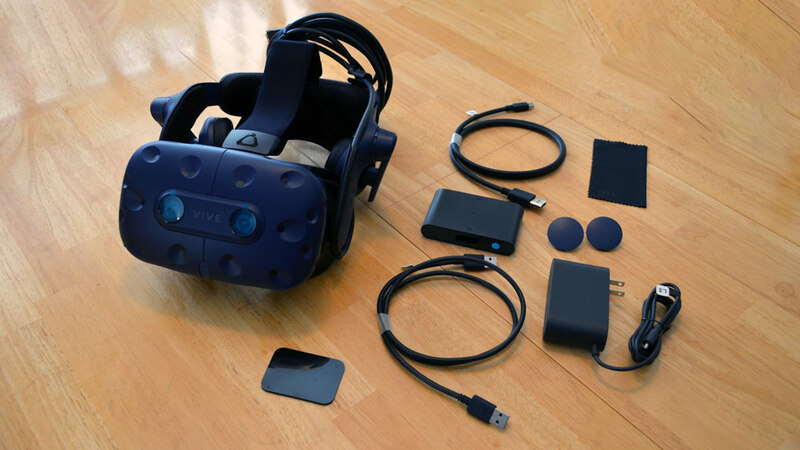 The challenges users encounter with the previous version of HTC Vive is the weight of the gadget. The headset is heavyweight over the front face which pulls your head forward and possibly could cause some pain on the neck but HTC Vive Pro has good weight distributed strap which ensures an even weight distribution across the head, it reduces the risk of having neck pain. What’s new in HTC Vive Pro? The premium virtual reality headset has the ability to overlay images onto real scenes using its 3D sensors and dual front-mounted cameras. This new innovation of technology allows users to alter reality images which are tractable by adding images in real-time to their physical environment instead of creating everything the user and totally blocking out the world around them. The software has improved the HTC Vive Pro user experience by adding a multitude of new features such as the ability to capture a 3D scan of a room then place virtual objects in either the background or foreground of the room. Adding onto the headset detail, it has an accessible volume control on the rear of the left earcup. Is it worth for the upgrade? HTC Vive is gradually earning a reputation as the most capable virtual reality hardware. The headset allows you to create a virtual world of about 15 x 15 foot in which you can walk around. It offers a special resolution than the standard Vive and can give games a fantastic look with less screen door effect. It has rubber nose guards from the headset itself which prevents light from filtering into the crack between the headset and your nose and a plushy foam pad which softens the device on your face for more comfort. Its improved weight distribution and a built-in earphone gives the headset a good sound and makes it feel as good as the game looks. There is also a second front-facing camera at the front of the headset which offers improved tracking for developers who intend to make Augmented Reality (AR) experiences. HTC Vive Pro is undisputedly the next generation upgrade and it’s worth for those who enjoy virtual reality to play games with greater graphics. When Watching 360 VR Videos, Why Does 4K Look Like 480p?